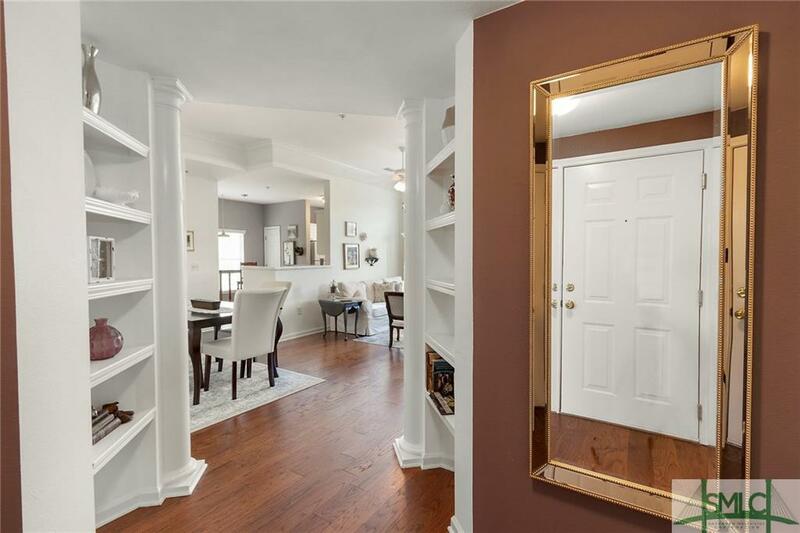 Imagine coming home to this Elegant Updated Condo in the Merritt at Whitemarsh with Resort Style Amenities including Community Pool, Hot Tub, Fitness Facilities, Dog Park and Clubhouse. This is Island Living at its BEST! This top floor unit has high ceilings, brand new engineered wood flooring throughout and a wood burning fireplace, plus no one living above you! It is also the Monterrey Floor Plan, which has the largest square footage (1116) for the 2 Bedroom floor plans offered at the Merritt. The current owners have updated the entire unit including kitchen counters, ceramic and glass backsplash, sink, dishwasher, light fixtures and fresh paint throughout, new sinks and fixtures in bathrooms and so much more!!! A desired garage space is also included with the sale of this amazing condo! The owners would consider selling completely furnished. Located on Whitemarsh Island, close to grocery stores, restaurants, gyms and just a short drive to Tybee Island and the City of Savannah! Listing courtesy of Deanna Baggett of Keller Williams Coastal Area Partners. © 2019 Savannah Multi-List Corporation. All rights reserved.